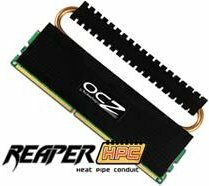 Delft, Netherlands—February 23, 2008 – OCZ Technology Group (LSE: OCZ), a worldwide leader in innovative, ultra-high performance and high reliability memory, today announced two new Reaper HPC solutions for enthusiasts upgrading to next generation of cutting-edge platforms. The PC3-10666 Reaper HPC Series is available in both 2GB and 4GB dual channel kits to meet the specific needs of customized gaming systems or workstations, offering perfect compatibility with the latest platforms and chipsets at a price that will be attractive to upgraders with a specific budget in mind. With the high frequencies of DDR3 comes added heat that can damage the module’s sensitive ICs. To ensure superior stability and performance over the entire life of the modules, the Reaper HPC Series makes use of an innovative cooling solution to more effectively dissipate heat produced by high-speed memory. 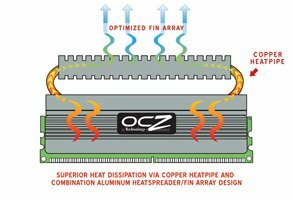 The thermo-conductive copper heat pipe conduit is ideal for overclocking where every degree matters, making certain that your cutting-edge investment will maintain its integrity throughout the toughest gaming missions, overclocking, or intense program applications.